Lucas Harskamp made waves in the toy industry when he published an opinion piece in ToyNews about children’s television content and franchise-related toys. In the article, Harskamp argues that inconsistency across a brand alienates children and causes franchises to falter. 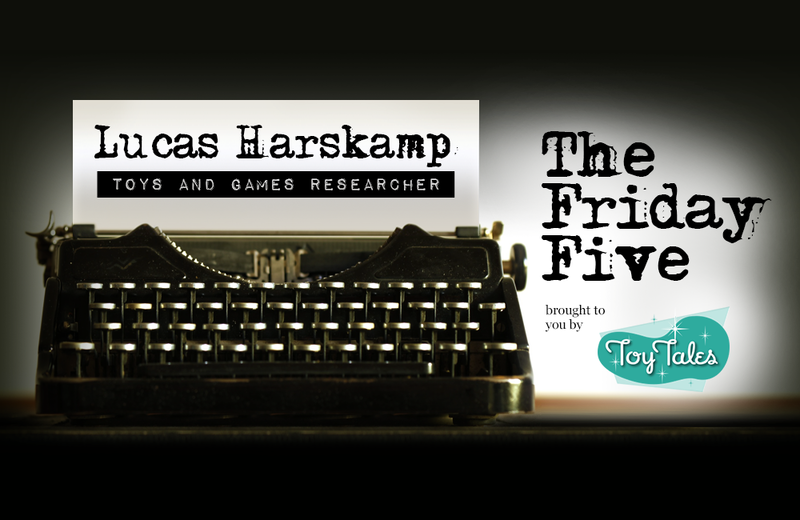 In this edition of The Friday Five, Harskamp expands on his theory and explains the inspiration behind his toys and games research. Tell me about your work as a game developer. I’m a developer and programmer by trade. Game architecture is my focus. During my studies, I created a game to help children learn to read the clock. That work – and an intriguing conversation with a school colleague about My Little Pony – ignited my interest in learning more about how children learn, play, and interact with the world. You wrote an opinion piece on ToyNews titled ‘Does TV content determine how children play?’ What event inspired that piece? It was a personal quest for me. I became fascinated by the relationship between toys and the television and movies on which they are based. I looked into four generations of media and started to develop my opinions about why some franchises succeed while others quickly fail. You suggest in the ToyNews article that much of the television programming for children is created specifically to sell toys. Are children being done a disservice with this mentality? When written well and consistently, and if it has interesting characters, plots and settings, television programming draws children in and makes them think about what they’re seeing, so it does them a service rather than a disservice. If not done well, it backfires because the child cannot be drawn into a narrative. There is more methodology required than people – and some businesses – realize. Children need context to play with toys. Star Wars is a great example of doing it well: there are recognizable personalities, consistent villains, familiar locations. Children remember all of these elements from the movies and bring those elements into their play habits. When a franchise isn’t consistent with their branding – maybe the colours differ from movie to toys or the villain is released as a toy before children have a chance to see it on the screen – kids quickly lose context and their interest wanes. Franchises need consistency throughout the entire experience they offer. What has the reaction been to your article? I am approached by people from all walks of life, like toy creator hobbyists, inventors, industry folk, as well as Transformers, Barbie, Thundercats, and My Little Pony fans. I discuss with them what they think of my work, the things they love, and I listen to their perspectives. Some people disagree with my argument that consistency across a brand is a vital element. Some people have told me that there is no relationship between the quality of the show and toy sales and that the mere existence of the show does most of the work. What can parents do to untangle their children from excessive cross-promotional branding? Cross-promotion is part of today’s environment and it’s for each parent to decide what’s acceptable. I’d like to see the content of the media elevated beyond “eat your dinner” and “be nice to other people”. Those are nice lessons, but children’s media shouldn’t be afraid to introduce age-appropriate conflict scenarios, for example. Companies fear backlash from parents and I think that holds them back from reaching higher quality. Conflict is great for the kids themselves because it gives them something to think about. However, parents do need to look out for shows that push a political opinions – think that goes too far. Lucas Harskamp continues his research into toys and games while working as a solutions architect in the Netherlands. You can read more of his findings on LinkedIn. Just 15 years old, Ethan Klein has already co-created an award-winning STEM-based learning toy for children. Klein talks about his own STEM experience and explains why winning a 2018 TAGIE award is so important.